Okay, so there’s a bunch of stuff to review. Let’s cover it by way of an INBOX to flesh out some of the ideas and knowns and unknowns. First, let’s briefly cover last night’s game. I’ll pass the torch to you for first reactions. Andy G: First reaction would be that last night’s game is a microcosm of the Kevin Love Era of Timberwolves basketball. Love put up Chamberlainian NUMB#RS in a losing effort to a “decent” team. No exaggeration here: Love dropped 43 and 19. In a loss. To the Hawks. I’ve seen this movie before. It’s not a good movie. The Wolves aren’t very good defensively. (Duh.) Yeah, they’re smart about not fouling too much and their efficiency stats are pretty decent. (They remain 11th ranked in the league.) I tried to think of a way to capture what I feel like is the truth (the Wolves stink on defense, despite the overall efficiency metric that says otherwise). The best I could come up with is to filter by 4th Quarter defense in losses. The Wolves have too many blowout wins (and almost no close wins) to make their fourth quarter performance a reliable measure of anything. But they have 24 losses in 47 games, and a great deal of those were games that the Wolves *could’ve* (should’ve?) won. Last night, the Wolves scored a ton in the fourth quarter. 38 points. That should’ve been enough to come back and win, but they allowed the Hawks — THE HAWKS! — to score 34 in the same period. I don’t have it in me to dig into more detail than that. The roster just isn’t built very well, right now. There are too many one-way players. I’m not even sure there’s a single “two-way” player on the team. That makes it hard to win against good teams, or build anything resembling a sustainable formula for success. So, there’s more to it than that – what of the Adelman-Rubio-Barea dynamic that’s been overshadowing backcourt rotations lately? The Wolves are at home for tonight’s tilt against the Cavaliers. The tip is at 7 P.M. CST. You can watch it on FSN (most of you) or League Pass (me). The starting lineups should look like this. Several interesting matchups stand out. Rubio-Irving is the marquee matchup. Ricky is a flashy point guard who’s leading the league in steals and is one of the best defensive point guards in the business. As Wolves watchers know too well, Ricky has his problems shooting the ball, and with scoring more generally. Irving is Rubio’s mirror opposite in many ways, excepting the flashiness part: Kyrie is arguably the best pure-shooting point guard in the League not named Stephen Curry, but he struggles mightily on defense. Ironically, Mike Brown executed perhaps the best in-game strategy of any opposing coach this year to exploit Ricky’s shooting ineptitude, daring Rubio to take open shots and doubling down hard on Wolves post players, who struggled to get any interior offense going against the Cavs’ collapsed, outsized defensive trio of Anderson Verejao, Tristan Thompson (! ), and Andrew Bynum, the last of whom has been moved into the starting lineup in place of Verejao. The Wolves might consider executing a similar strategy by trying to bait Dion Waiters into taking long jumpers whilst shading Kevin Martin to help against Cleveland’s bigs. Andy G: Last night, the Timberwolves beat the Knicks and improved their record to 3-0. This marks only the second time in 25 seasons of franchise existence that the team won its first three games. Setting aside what that statistic says about the past, it is a small, early accomplishment worth feeling good about on the season’s first Monday morning. An undefeated start is especially impressive considering that the Wolves faced Kevin Durant and Carmelo Anthony in consecutive matchups. The Wolves won the game at the foul line, where they made 29 out of a whopping 38 attempts. (The Knicks only shot 13.) After a blowout first quarter of steals and pass-ahead assists to Brewer and Love, it was all about survival. Carmelo eventually started making shots and the Knicks cut the deficit to 2 with 4:48 to go. But Kevin Martin converted a technical foul free throw, followed it up with a three-pointer (his fifth of the night; he scored a wildly-efficient 30 points on 12 shots) and the game never got close again. Patrick J, what’s up with the crazy free throw disparity? What will we call it? Andy G: I like it. PDW ASSAULT will be a short list of players around the league that we’ll focus extra league-pass attention to, and blog about at least semi-regularly. For good measure we’ll add a “PDW ASSAULT” link to the Categories sidebar, for organization. This is the time of year when you appreciate basketball’s aesthetic pleasures. You step back, take a deep breath, and revisit the finer things. You know, the crossovers. The dunks. And the treys. And I’d be remiss not to mention technicolor sneakers. Jason Williams has one gear and one gear only. He’s a fixie. 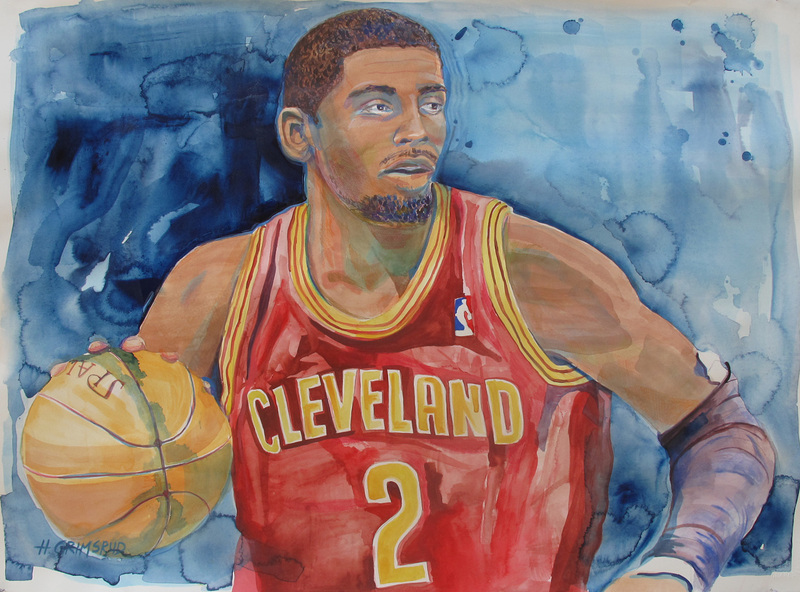 Tonight the Wolves are in Cleveland to take on Kyrie Lee Irving and his Cleveland Cavaliers (6PM CST, FSN, 830-AM). Hands down, Kyrie Irving has the best handle, and possibly the coolest offensive repertoire in the NBA. That’s the need-to-know. Rinse, repeat, enjoy. The Wolves have a new player. And it just feels right. It’s like we were destined to get him as part of a Ndudi Ebi exorcism after Brandon Roy’s five-game trial failed to redeem Roy-Foye. On Josh Howard’s future with the Wolves, go check out Oceanary’s post at Canis Hoopus.